State-of-the-art hot water, heating and cooling systems designed and made in Victoria will soon be exported, after Rinnai Australia today officially opened its new network of Melbourne manufacturing facilities and R&D Centre, which will create new jobs in Melbourne’s South East. 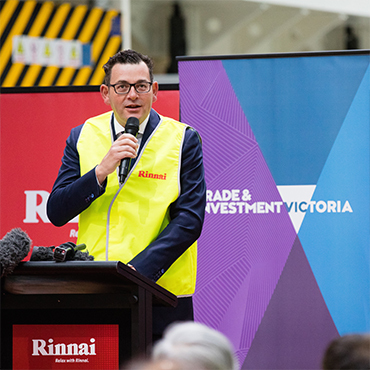 Premier Daniel Andrews attended the official opening of the new premises and congratulated the company on its major investment in local manufacturing, which also secures the jobs of Rinnai’s existing 380-strong Victorian workforce. The new 68,000 sqm site will produce gas and electric hot water systems, air conditioning systems and solar renewable products and includes a new R&D ‘Centre of Excellence’, which will develop and test new products for Rinnai subsidiaries across the world. ‘These are truly exciting times for Rinnai, our channel partners and the Australian market as we increase our ability to deliver new and exciting products through local expertise and manufacturing capability’ says Greg Ellis, Rinnai Australia Managing Director. ‘Whilst Rinnai has long been regarded as the consumer and trade choice for our extensive hot water solutions, the recent investments we’ve made now allows us to provide a full range of reliable, heating and cooling products all year round catering for every home and lifestyle’ says Greg. From humble beginnings in 1971 selling a small range of domestic heating products, Rinnai Australia has evolved into a highly successful provider of domestic, commercial and industrial products & solutions. Rinnai Australia acquired the Brivis business in early 2015 further enhancing Rinnai’s local manufacturing operations. Today Rinnai has grown to become one of Australia’s leading industry suppliers and innovators for Hot Water, Heating, Cooling and Commercial equipment as well as a trusted household name synonymous with reliability and quality.